"Nathaniel ‘Nat’ Shilkret (1889-1982) was a multi-talented instrumentalist and arranger who came up through the ranks of the Sousa, Pryor and Goldman bands. In 1919 he was named director of light music at the Victor Talking Machine Company, remaining in this job until 1935. Shilkret was responsible for booking hundreds of recording sessions involving various bands, and for recording material under his own direction that Victor’s contract artists didn’t care to handle; mainly waltzes, operetta melodies and sentimental salon selections. Nat Shilkret had considerable clout at Victor, and brought it to bear on a series of Symphonic Jazz recordings made in the period 1928-1932, collected for the first time in this package. Nat Shilkret the composer is represented by his symphonic poem Skyward, a modest and fairly lightweight piece compared to the major work on this collection, the ballet Skyscrapers (1926) by Chicago composer John Alden Carpenter. Skyscrapers is big city music, modern in style and meant to reflect the excitement of urban life in the 1920s. 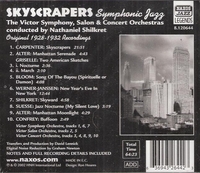 Carpenter is credited with being the first American composer in a concert milieu to incorporate the sounds of jazz in a short portion of his ballet Krazy Kat (1921), but Skyscrapers has its own rhythms, and is more jazz-inflected than ‘jazzy’. More of John Alden Carpenter’s music may be heard on a release in the Naxos American Classics series (8.559065). In 1928 Nat Shilkret established a competition for the best modern American composition. The grand prize of $10,000 was awarded to a composer of enormous talent and no reputation, Thomas Griselle (1891-1955). Griselle was Ohio-born and had studied at the Cincinnati College of Music. After World War I he became a recording director at the Gennett Studio in New York City, and later recorded piano duets for Edison. Upon winning the prize, Griselle went to Europe and studied with both Nadia Boulanger and Arnold Schönberg. The titles of his works, such as "Cubist Foxtrot" and "Czerny Pilots a Flying Saucer" are intriguing, but Griselle’s output has yet to be investigated by scholars. The "Nocturne" movement of Griselle’s Two American Sketches became a sort of underground standard in the Big Band era, and was recorded by Artie Shaw and John Kirby among others. The second prize of $5,000 was given to a much better known composer, Rube Bloom (1902-1976). Completely self-taught in music, Bloom was already established by 1928 through his popular novelty ragtime pieces such as "Soliloquy" and "Spring Fever". He would later distinguish himself in composing popular songs that have since become standards, such as "Give Me the Simple Life" and "Fools Rush In" (written with Johnny Mercer). Song of the Bayou is one of only a few pieces that Bloom wrote with the concert hall in mind, the rest of his output being in a purely popular vein. Another composer that made his reputation in novelty ragtime was Louis Alter (1902-1980). Shilkret thought enough of Alter’s music to record two of his compositions, Manhattan Serenade and Manhattan Moonlight. Like Bloom, Alter was primarily a writer of pop songs; among his hits were "My Kinda Love", "A Melody from the Sky" and "You Turned the Tables on Me". Manhattan Serenade itself became a hit after Harold Adamson added words to it in 1942. Unlike Bloom, Alter continued to write serious music beyond 1932. Werner Janssen (1899-1990) studied composition with ‘Boston School’ composers Frederick Shepherd Converse and George Chadwick at the New England Conservatory, and conducting in Europe with Hermann Scherchen and Felix Weingartner. After making his début with the New York Philharmonic in 1934, Janssen would go on to a long and distinguished series of conducting engagements throughout the United States, most famously with his own Janssen Symphony Orchestra in Los Angeles from 1940 to 1952. Though Werner Janssen was a champion of contemporary music, in his own work he preferred light, programmatic pictorial pieces, of which New Year’s Eve in New York is an outstanding example. Paul Whiteman sponsored the early concert career of Dana Suesse (pronounced ‘Sweese’, 1909-1987). Born in Kansas City, Suesse had studied piano with Alexander Siloti and composition, like George Gershwin, with Rubin Goldmark. Suesse carried the banner of Symphonic Jazz into the 1950s, well past the point when even the term was considered an anachronism. Suesse’s second foray into the Symphonic Jazz idiom, Jazz Nocturne (1931) was remade into the popular song "My Silent Love", presented here. Among other standards that Suesse composed were "You Ought to be in Pictures" and "The Night is So Young and You are So Beautiful." Edward Elzear ‘Zez’ Confrey (1895-1971) was the premier composer of novelty ragtime in the 1920s, internationally famous as a result of his hits "My Pet" (1918) and "Kitten on the Keys" (1920). Confrey was already well acquainted with Shilkret, who likely led the band on Victor’s early 1920s recordings credited to ‘Zez Confrey and his Orchestra’. Buffoon is a late piece in the Novelty Ragtime canon, and by 1932 was already considered something of a throwback to an earlier time. But that does not negate its obvious charm, and it brings this collection to a fun and rousing conclusion. A generous selection of Zez Confrey’s solo piano pieces may be enjoyed on a Naxos American Classics disc (8.559016). The legacy of Symphonic Jazz represents the first time musicians from both sides of American musical life, classical and popular, would be brought together on the same plane of activity. The very concept of ‘Symphonic Jazz’ would be ultimately excoriated by many critics as being both pretentious and detrimental to jazz. But in the years after the twentieth century has drawn to a close, when the Classical music charts are dominated by ‘pop crossover’ items of all kinds, perhaps it is time now to take a second look at the work of Nat Shilkret, Whiteman, Ferde Grofé and the others. It does appear that Symphonic Jazz was not such a bad idea after all."